It’s been almost 40 years since American Airlines (AA) launched its full-scale loyalty program – a move seen at the time as a promotional gimmick. Gimmick or not, that initiative spawned a highly lucrative revenue stream for carriers around the world. AA alone generated US$2.1B in revenue last year through its AAdvantage program. And the profits are even higher this year as more people are taking to the skies for work and pleasure. 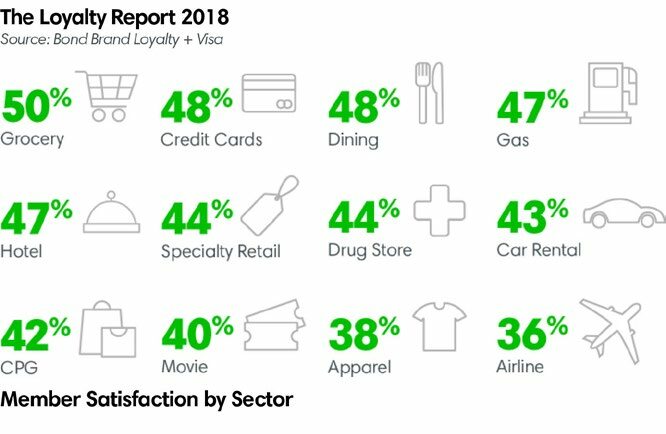 In 2018, Bond Brand Loyalty, in partnership with Visa, surveyed over 50,000 consumers across North and South America and Europe to determine the state of loyalty programs across 15 industries. In terms of member satisfaction, airlines found themselves at the bottom of the scale. I must admit I was a little surprised at that. As a frequent flier, I belong to a number of airline loyalty programs and although many of them have room to improve, I didn’t think the situation was as dire as the study implies. So I took a look at the University of Michigan’s American Customer Service Index which measures how good or bad an industry is performing when it comes to satisfying consumers. Its 2018 index reported that airlines were in the bottom 20% of US companies – a position they’ve been in since 1994! 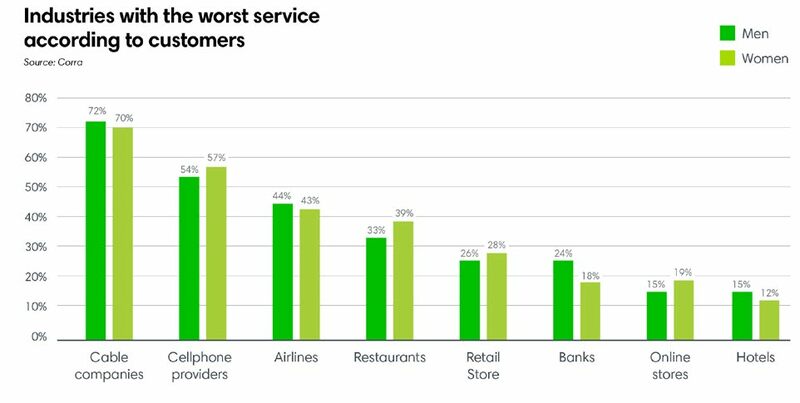 Digging a little deeper I learned that Corra’s 2017 reputation study found that when it came to customer service, airlines ranked as the 3rd worst industry behind cable and mobile phone companies. More and more airlines are changing their definition of a “loyal customer.” It’s no longer the person who flies the most with an airline (i.e. accumulates the most miles), it’s the traveler who spends the most money with the airline. Frequency has been trumped by finance in the calculation of how many miles a member can redeem. Many airline programs now have a revenue prerequisite where points are not enough to elevate a person’s status; the member has to also spend a specific amount of money with the airline to qualify for the next level. Economy passengers are increasingly finding themselves assigned seats with only 29 inches of pitch. Airlines haven’t mastered the art of using data to lift the morale of all travelers, not just the select few in the forward cabin. Whatever the reason, it’s clear that when it comes to customer satisfaction and loyalty, most airlines have a lot of room to improve. Historically, companies created loyalty programs to benefit themselves, often at the expense of the consumer. But there are people-centric brands that have figured out how to make money and happy customers at the same time. When it comes to driving that emotional engagement, airlines could learn a lot from brands like Amazon, Starbucks, and Walgreens. They all have very high customer retention rates because their rewards programs are some of the best in the world. 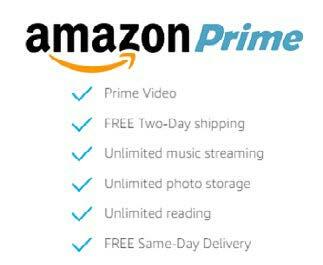 Let’s look at one: Amazon Prime. An ecosystem that converts 60% of customers into paying members, Amazon Prime is successful because it offers benefits customers’ actually care about enough to actually pay for them. It started with free two-day shipping back in February 2005 and continued to up the ante by adding features and benefits members value. And what they value, beyond the table stakes of free shipping, is access to quality content. In 2017, we partnered with the Airline Passenger Experience Association (APEX) to gain insights into airlines’ plans for improving customer experience. 60% of executives said the most challenging part of the passenger experience was improving the inflight component of their journey. So what can airlines do to help distract flyers from the negative effects of “cabin crunch?” What amenities and engaging activities can help keep them entertained and satisfied? According to the most recent Expedia Passenger Preferences Index, the following five items are what passengers say they “could not live without” in midair. One can see that the desire for quality journalism is still strong. In the past, a limited selection of printed media was offered in the forward cabins, and occasionally a few leftovers were handed out to economy passengers. 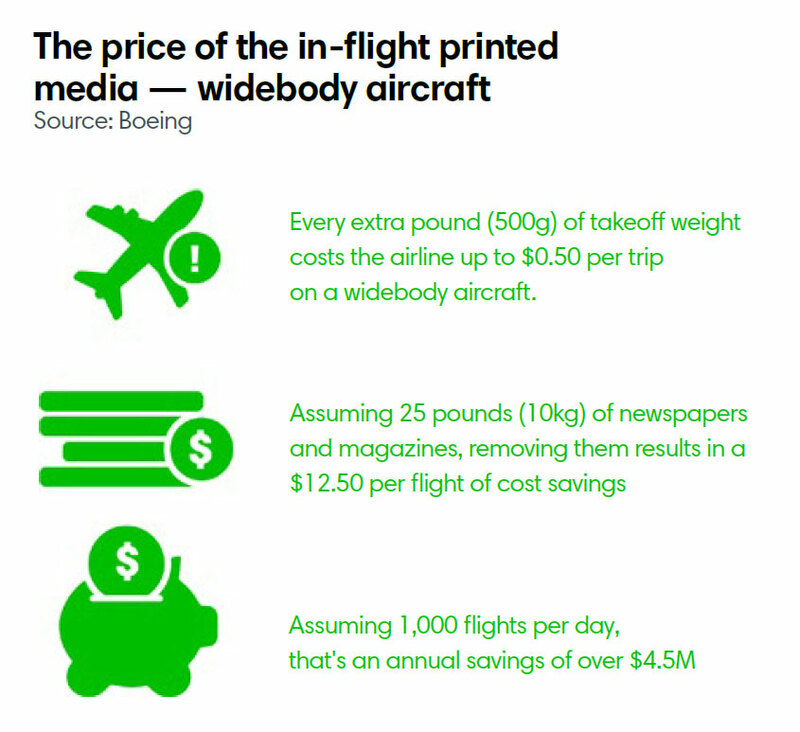 This practice is becoming less and less common as airlines recognize the cost-benefit analysis of switching to digital media. According to our APEX study, over 70% of carriers have already stopped offering printed media on-board or plan to stop within the next three years. We’re honored to work with some of the most proactive airlines in this transition from print to digital. Air Canada, British Airways, Cathay Pacific, Iberia, and Virgin Australia (and others soon to be announced) are all using premium digital content (newspapers and magazines) to drive positive brand experiences across numerous customer and employee touchpoints: pre-flight, check-in, in airport lounges, in-flight, post-journey, and email. They also distribute their in-flight magazines through PressReader, helping them reach hundreds of millions of people (i.e. potentially new customers) from around the world. In 2017, an Accenture strategy report, Seeing beyond the loyalty illusion: it’s time you invest more wisely, gauged the experiences and attitudes of more than 25,000 consumers worldwide about their loyalty relationship with brands and organizations. In it Accenture defined five languages which it says are driving consumer relationships in the digital age, especially with millennials. Leading the way is the offering of small tokens of affection. Studies have shown that when people receive a small token of affection, they respond in a number of different, often unconscious ways. Most feel a real sense of indebtedness towards the giver — a reaction coined as the reciprocity principle. Imagine giving every passenger traveling to Auckland a complimentary digital copy of New Zealand Adventure when they book their ticket, or The Guardian Australia when they enter the lounge before boarding their flight to Sydney, or an issue of their hometown newspaper, Los Angeles Times on their flight home. It really comes down to airlines offering a choice of content when and how passengers want it. For some people print is still their preferred choice, but for the majority of consumers today, who want personally-relevant titles, a digital aggregation of content is the most affordable and desired option. Which is why airlines need to address the needs of both types of media consumers if they hope to create a personalized onboard reading experience. Human- and digitally-delivered experiences are both essential in travel and easily delivered if airlines put themselves in the shoes of their customers and align their business values around the passions, habits, and preferences of 21st century passengers. So why not speak to your passengers and staff in a language of loyalty through creative digital experiences that resonate with them. Give them small tokens of affection they’ll appreciate, remember, and tell their friends about – unlimited access to more than 7,000 of the world’s best newspapers and magazines is a great place to start. Want to learn more? Let’s talk!